Cosmin's grandmother lives in a little village called Unimat in Transylvania, her kitchen is in a separate building to the main house and everything is cooked on a tiny wood burning stove. They grow their own crops, make their own palinca (plum moonshine), and fatten up pigs and chickens for the chop. I love Cosmin’s gran, she force feeds you with the biggest smile on her face but you can’t begrudge her because she’s an excellent cook; and she’ll tell you that …in fact she’ll tell you that she’s the best cook in the whole of Romania. 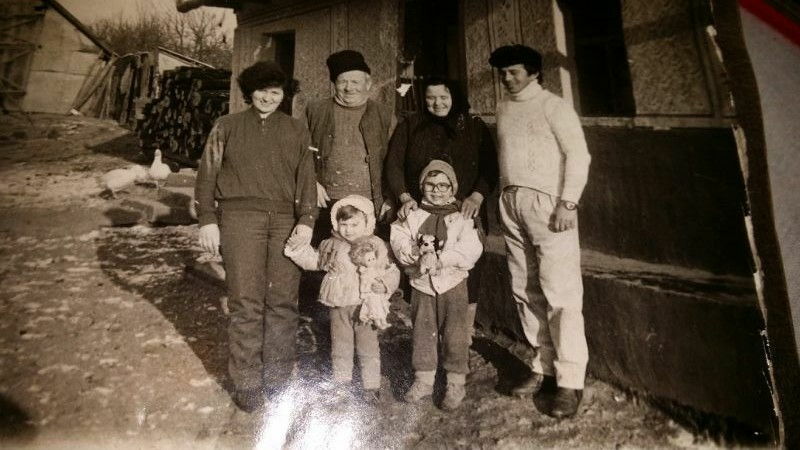 Clockwise from top left Cosmin’s mother, grandfather, grandmother, father, Cosmin and his sister outside his grandparent’s kitchen. In the towns and cities kitchens are for the most part very similar to those in England, the only difference being what you can expect to find in the fridge. There will always be a vat of ciorba (a catch-all name for various soups seasoned with vinegar and sour cream); you’ll probably find a batch of sarmale (cabbage rolls stuffed with pork and rice) which a well-meaning aunt has insisted you take home so you don’t starve; hanks of salted pork; pickles galore; the biggest juiciest tomatoes in the world; cheeses and massive chunks of slanina (unrendered pork fat); As for Cosmin’s folks home in Tăşnad you’ll also find a wedding cake or three (his mami has a cake business).